The mission of the Town Clerk/Tax Collector office is to provide the residents and property owners of Hill with efficient, friendly, accurate and timely services and information. 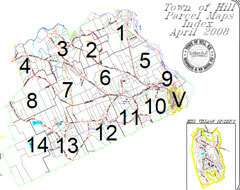 The Town Clerk functions that are of high importance include not only processing of motor vehicle registrations, voter registrations, election processes and dog licensing, to name a few, but also the preservation, retention and accurate issuance of vital records, preservation of all contracts, agreements, ordinance books and other Town documents, preservation and archiving of all Town meeting, local boards and commission minutes as well as administer the “oath of office” to elected officials and appointees. The purpose of the Tax Collector function is to collect as much tax revenue as possible through out the year to help the Town meet its financial obligations of each year. The Tax Collector is responsible for the preparation and mailing of the tax bills based on information received from the assessors. The Tax Collector is also responsible for the processing of property tax liens on properties that become delinquent as a way to help protect the revenue base for the Town. As Tax Collector the office also performs the billing and collection functions for the Hill Water Works.